Arsenal ready to sell Mesut Ozil? Arsenal are reportedly prepared to consider offers for midfielder Mesut Ozil when the transfer window reopens in less than a month's time. The former Germany international has failed to make the previous four matchday squads with the club after a back problem while only being an unused substitute in the Bournemouth game prior to that. Amidst this, there has been speculation regarding his long-term future with the club and according to The Mail, the Gunners could be willing to sanction his sale at the turn of the year. It is added that Emery no longer considers the German as integral to his first-team plans and a package of around £25m could be sufficient to push him through the exit door. Inter Milan are currently the prime candidates to pursue the attacker, although his staggering £350,000-a-week could prove a stumbling block for the San Siro outfit. 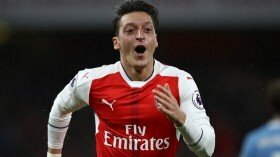 Ozil had returned to light training during the past week and it remains to be seen whether he would feature for the Gunners when they entertain Qarabag in the Europa League on Thursday night.